Hi lovelies! 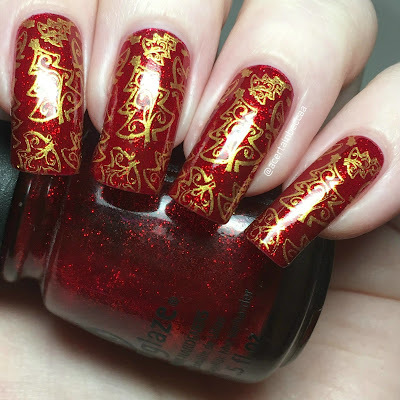 Today I have four more Christmas manis to share with you, this time using UberChic Beauty stamping plates. I have already shared a couple recently using the new Holiday Jingle plate, but obviously I had to create some more! Christmas-01 and Christmas-02 have been renamed (to Holiday Spirit and Holly Jolly), but still have all of the same images and are Christmas must haves! Read on to see all four manis and for more info. First up, I have a gingerbread mani. 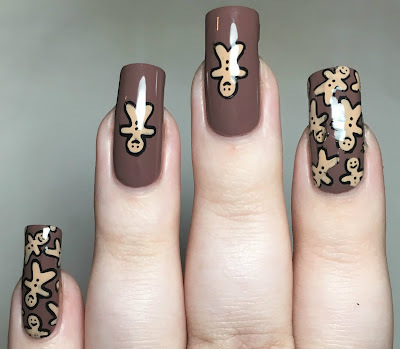 I absolutely love gingerbread men, both the Christmas character and the food, so I knew I had to use the cute images on the Christmas-01 plate. I started with a base of Essie 'Mink Muffs', and then reverse stamped. 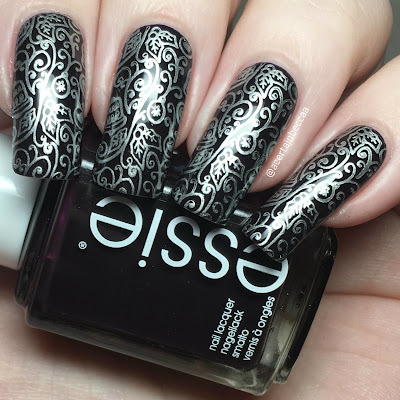 I used a Born Pretty Store black stamping polish, and coloured in using Barry M 'Sunkissed'. 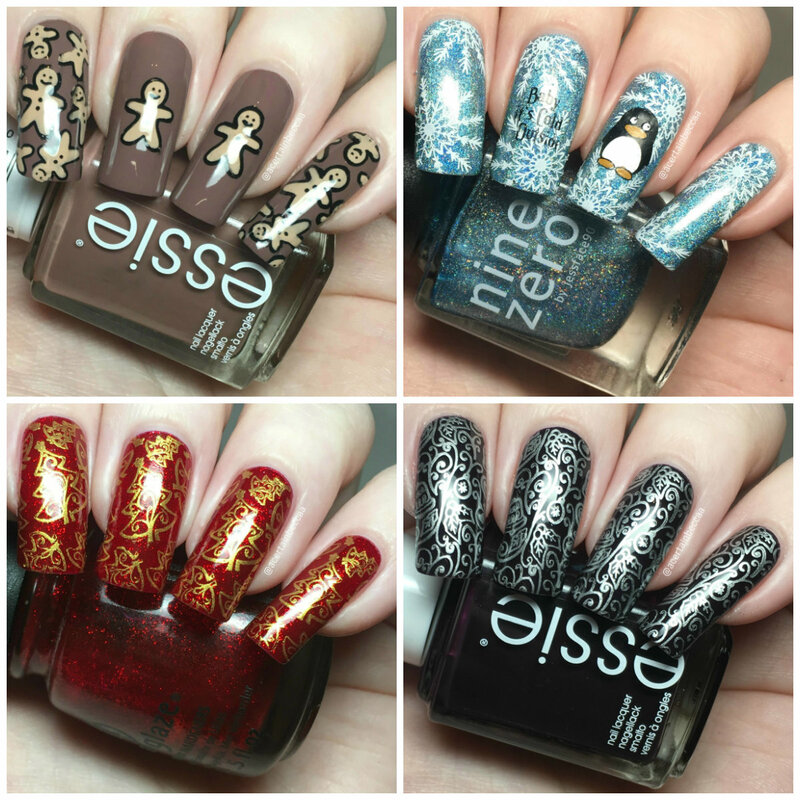 Next I used various images from Christmas-02 over Nine Zero Lacquer 'December 2016'. I stamped one of the large snowflakes randomly onto each nail using Hit The Bottle 'Snowed In'. Then, I stamped the 'Baby It's Cold Outside' wording in black on my ring finger. 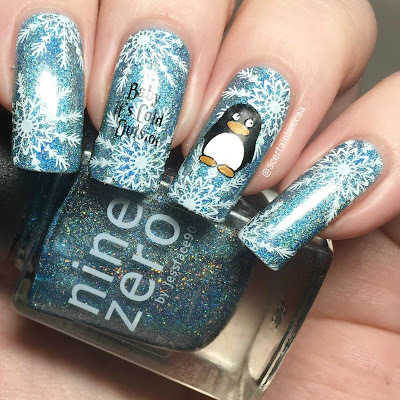 I also added a reverse decal of the penguin image onto my ring nail, stamping in black and using Hit The Bottle 'Snowed In' and Essie 'Tart Deco' to colour. Next I went for a classic red and gold combination. This time I decided to keep it a bit more simple. 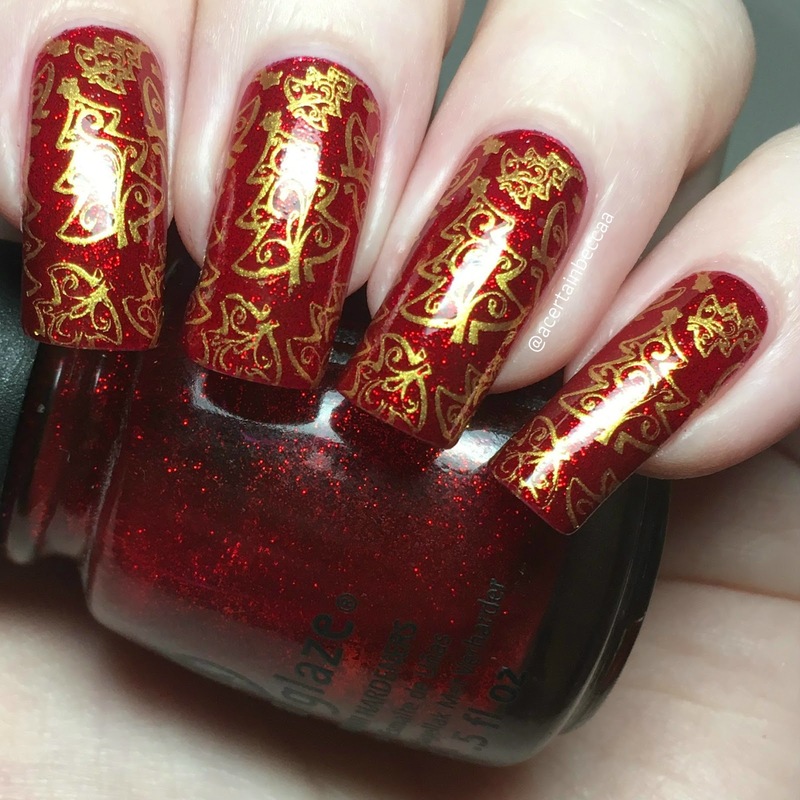 I stamped one of the Christmas tree patterns from the Holiday Jingle plate using a Born Pretty Store gold, over a base of China Glaze 'Ruby Pumps'. For my last mani, I again used the Holiday Jingle plate and kept it simple. I stamped the swirly pattern with bells and holly onto a base of Essie 'Luxedo' using Barry M 'Silver Foil'. What do you think? 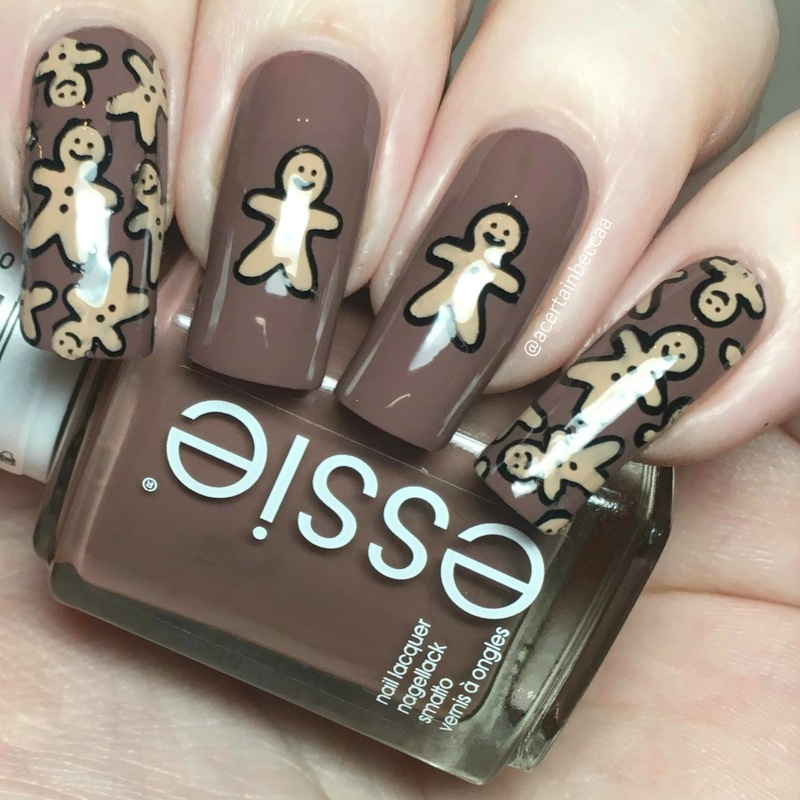 Which one would you be most likely to sport on your nails over Christmas? I'm a big fan of UberChic Beauty plates all year round, but I especially love their Christmas ones. There are still a lot more images I want to use and manis I want to create, so fingers crossed I can squeeze a few more in! 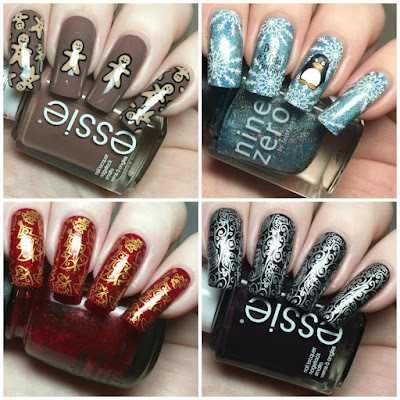 You can find all three of the UberChic Beauty Christmas plates on Rainbow Connection here. Orders will not be shipped until the 3rd January due to Christmas closure, although I'd still get them ready for next year!